ven though Parker had had a bad experience with the legendary Parker "T1", a venture during 1970-1971 to produce an all-titanium pen with an integrated nib, they couldn't all together forget about the sleek, well balanced and attractive design. The main problem with the T1 had been the toughness of the titanium that made production costs too high. In time for the christmas season 1978 the Parker "50" Flighter appeared on the shelves. It borrowed many features from the predecessor Parker "T1" with one big difference: it was made of steel, not titanium. The Falcon had a body ring, a bit broader in comparison to the one on the T1 and while the T1 had a small breather hole in the nib-part, the Falcon had not, instead the brushing, or rather frosting, ended in a tip on top of the nib, creating a striking effect. It was also a little slimmer and longer than the Parker "T1" had been. hen the Falcon appeared in the 1979 Parker catalogue it was offered in one finish only, as an all steel Flighter. 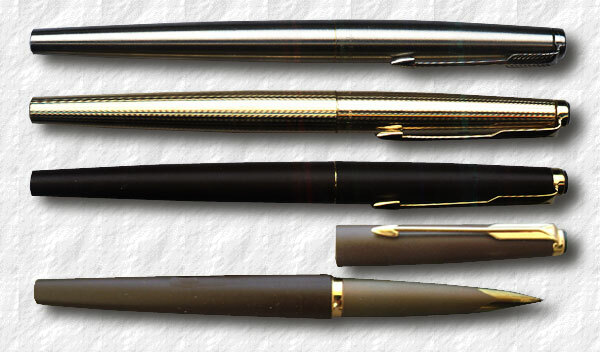 The fountain pen cost $25, the ball pen $15 or as a set for $40. The cap and body came in a brushed, stainless steel design with an electroplated 22k gold clip. It was offered in three nib sizes, Fine, Medium and Broad, the latter not offered in the sets. The catalogue refers to the nib as a "unitary" nib. It sold very well and Parker realised it's potential. Cashing in Parker raised the prices for 1980. Now a Flighter fountain pen cost $30, a ball pen $17 and a set $47.50 (still no real bargain for the set). A Falcon in a Matte Black finish was also introduced referred to as the 50B or TX and a year later, in 1981, the Gold version, or Signet, was launched as a part of the heritage collection. It was referred to as "the luxury look of tapered 12k gold fill". Matching pencils were also offered. The gold Falcon cost $125, the ballpen $75 and the pencil, with a 0.7 led, $75 as well. A ball/fountainpen set was offered for $150. Extra fine was added to the nib size options. Falcon Flighter, Signet, TX and Matte brown (open) from around 1980. There were several attractive finishes offered for the Gold Falcon but the line took a severe beating when the prices of gold rose to the roof in the early 1980's. The last design to be offered was the Parker Falcon in Matte Brown but already in 1982 the Falcon had disappered from the production catalogue. The uncatalogued Falcon Flighter Secretary pen is the rarest of the Falcons. iven the four only basic colours it is very easy to complete a Falcon collection and, though rather common — especially the Flighter model — they are very sought for among collectors and, perhaps, a bit overpriced. But, in comparison to the T1, they are good writers and do not suffer from the T1-problem of a somewhat fragile nib-tip. They have been referred to as the "poor man's T1". To mark the introduction of the Falcon in 1978 Parker commissioned a limited edition of 100 statuettes of a Peregrine Falcon in sterling silver, based on the design of Alex Jardine, of the Society of Wildlife Artists. A Falcon Secretary pen from around 1980. A Falcon statuette limited edition, 1978.